Kanchanaburi is a perfect destination to make a day trip from Bangkok. Besides the beautiful River Kwai and the Erawan National Park, Kanchanaburi is also interesting for its tragic history. 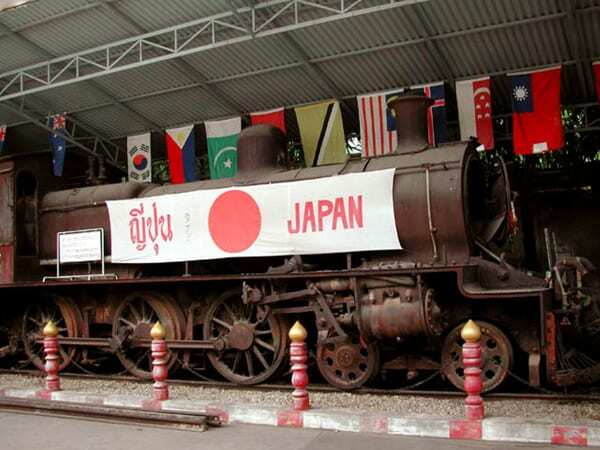 Located 150 km to the west of Bangkok, Kanchanaburi was the place where prisoners of war were exploited under the Japanese army during World War II. They worked to build the rail route from Thailand to Myanmar, and now that rail route is called Death Railway. The dreadful story of the POWs was made into a movie in 1957, entitled ‘The Bridge over the River Kwai’. Since then, Kanchanaburi became well-known and visited by many tourists. The travelers from all over the world come to visit the museums, war cemeteries and Death Railway built by POWs with blood and tears. However, not only the history explorer but also those who want to enjoy lush nature and emerald lagoon visit Kanchanaburi often. Among so many attractions in Kanchanaburi, here are some of the best spots you can visit. 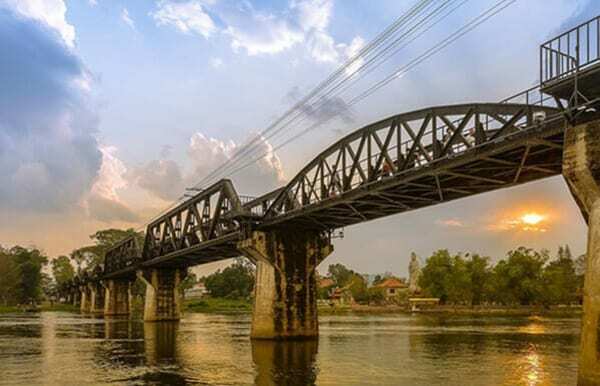 Bridge over the River Kwai is the most famous and well-known part of the Death Railway. It is known that 16,000 POWs and about 100,000 slaves died during the construction and that’s why it’s called Death Railway. You can actually walk across the bridge. Also, you can avoid trains or enjoy the view at the small side platforms between the spans. As the bridge is not only for sightseeing but also still used by locals, it is possible to take one of the trains that cross the bridge every day. The most famous section of the railway is the way to the “Dangerous Curve (Krasae Cave)”. If you want to take a tour with a train ride of this section, click here. Train Ticket Price: 100 baht for non-Thai nationality. Kanchanaburi War Cemetery is located opposite of Kanchanaburi railway station. This is where 7,000 POWs of the Death Railway are buried or commemorated. The POWs at this site are mostly from the United Kingdom, the Netherlands, and Australia. After the war ended, the Allies decided to move all the buried POWs bodies along the railway to either the cemetery in Kanchanaburi or in Myanmar if the POWs died closer to Myanmar(Burma). The cemetery is neatly maintained. However, during the rainy season access to graves may be closed to prevent damage to the grounds. 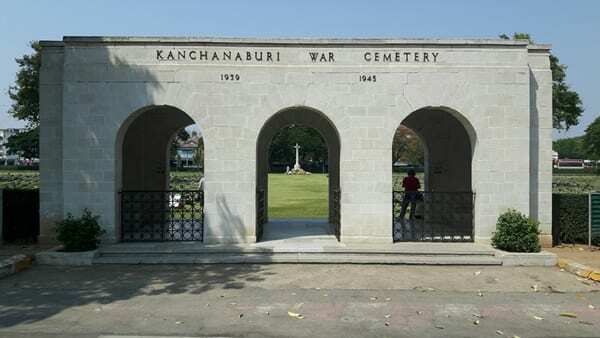 If you want to visit Kanchanaburi War Cemetery with other famous attractions, simply join this tour. JEATH War Museum is where you can learn more about the construction of the Death Railway and the prisoners. It is located close to the Bridge over the River Kwai. The museum is named after the countries whose casualties were meant to be commemorated: Japan, England, America, Australia, Thailand and the Netherlands. The building resembles the jail where the prisoners were actually incarcerated. It houses personal items such as photographs & clothes, also some drawings by ex-prisoners depicting their life in the camps. If you want to visit JEATH War Museum with other famous attractions, book this join-in tour. Krasae Cave is a small cave on the Death Railway near the famous Dangerous Curve. It has been said that this area was one of the most difficult to construct and also the most dangerous sections of the Death Railway. 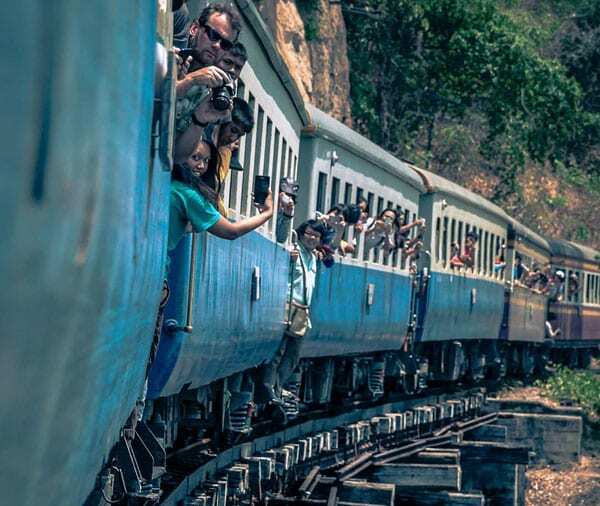 This is the spot where you might have seen in a picture with people sticking out their heads from the windows of a train on Death Railway. You can walk to the cave from the Thamkrasae Station. However, there are no handrails, thus be careful with some possible tripping. The train drivers are well aware that tourists do walk the tracks in this area and normally give enough warning with the approaching train. It is absolutely worth trying the walk if the heights don’t bother you. Krasae Cave houses Buddha images that the locals have respected for a very long time. 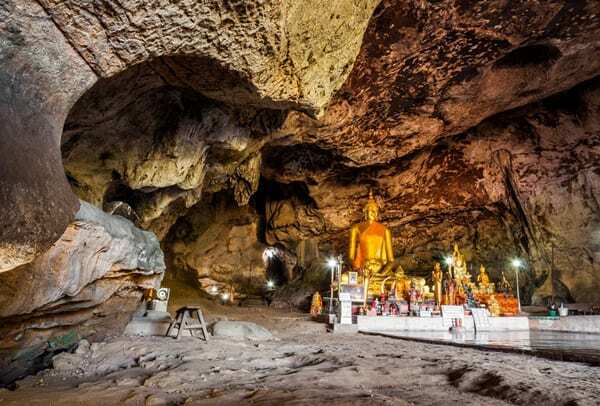 If you want to visit Krasae Cave with other famous attractions, the cheapest & easiest option is to book this join-in tour. The most luxurious ways to explore Kanchanaburi area would be by cruises or even jet skis along the River Kwai. Some people say it is the best thing to do in Kanchanaburi as you can really soak up the sceneries in such a chill environment. If you define yourself a thrill seeker, jet ski would be a better option for you than a cruise. Both options offer a short course (1hr, 1.5hrs) and a long course (2hrs, 2.5hrs). Choose based on your preference and schedule. If you want to get on a cruise or a jet ski along the River Kwai, book this private tour. You can get on it with additional charge. Besides its rich history, Kanchanaburi is also famous for its beautiful Erawan National Park. It has the famous Erawan Waterfall which is a seven-tiered waterfall. If you visit Erawan Waterfall, don’t forget a towel and some swimsuits, because there are plenty of turquoise lagoons which are perfect for swimming. When swimming, you will find doctor fishes everywhere eating the dead skin of your feet. They won’t hurt you, but the feeling can be strange and tickling at first. It takes a little time to get used to it, but you definitely should try it when you visit the Erawan National Park. Erawan National Park and the waterfall is tricky to get there by public transit. The best way to get there is to book a private taxi or transfer service. 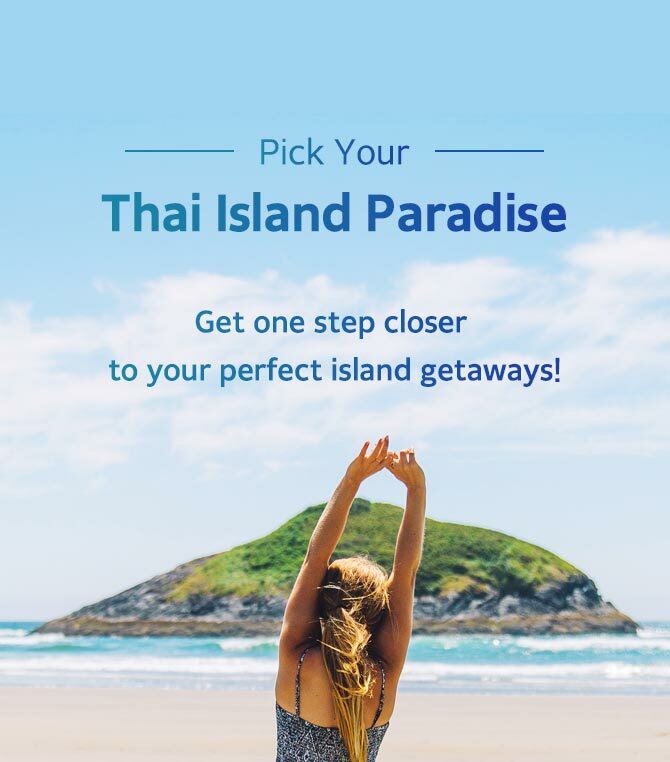 If you want to take a join-in tour at an affordable price to Erawan Waterfall & River Kwai, here’s the perfect tour for you. You can even check out Damnoen Saduak Floating Market if you want! To travel Kanchanaburi, you can either take a join-in tour at an affordable price or a private tour with your choices of destinations in Kanchanaburi. 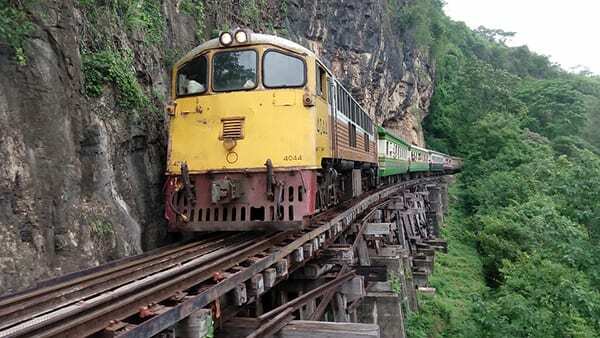 I would like to join the “river kwsi and death railway 1 day join your in Kanchanaburi” online. But it will not accept my submission. Can you please help. We would like to join on 13 Oct. 2 people.